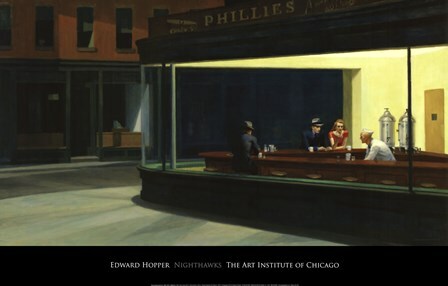 Edward Hopper was born in Nyack, New York. Between 1900 and 1905, he studied art at the Chase School in New York under Chase, Miller, and Henri. He became a late follower of the Ashcan School and worked with a fairly dark and somber palette. After a stay in Paris in 1906-7, he returned to the United States with a considerably lighter and brighter palette. Hopper exhibited with the Independents in 1910 and at the Armory Show in 1913, where he sold his first oil painting. Between 1915 and 1923, he worked as an etcher and commercial artist, for he sold nothing more until a show of watercolors in 1923 established him well enough for him to devote himself to painting in oils in the finished and highly personal style from which he never deviated. Hopper belongs to the group of American realists that includes Charles Burchfield, Thomas Hart Benton, and John Steuart Curry. His subject is America at its most everyday and ordinary: to his specific motifs-old houses, city and village streets, diners, lighthouses, movie theaters-he adds a characteristic romanticism. His work has a dreamlike quality and hints of the wish for something extraordinary that is also found in the heroes and heroines of Sinclair Lewis' early novels: his paintings are as stark as Main Street. He achieves this dream quality by his use of lighting, sometimes fading, sometimes spotlighted, sometimes contrasting clarity and darkness of effect. Life may be drab, but it retains the memory of, or the hope for, excitement and poetry. Hopper's recognition came late, but it included honorary university degrees and the Gold Medal of the National Institute of Science and Letters, as well as acceptance by both the public and critics.